Mahboba’s Promise is a non-profit based in Australia dedicated to helping women and children in Afganistan. Mahboba Rawi, a former Afghan refugee founded the charity organization. Their main focus is to rebuild the lives of widows and children who have been victims of war and local unrest. The organization provides educational opportunities along with basic needs in rural areas. The non-profit’s vision is to help secure a more stable environment for disadvantaged people in Afghanistan. Their projects include development aid targeted at children, orphans, widows and women. Current programs seek community rebuilding with new schools, community and healthy care facilities that will be run by local governments and communities. Mahboba’s Promise looks forward to new projects to further strengthen development efforts. Along with basic necessities and vocational training, a new youth leadership training project and permaculture project will be added. Mahboba’s Promise lends rural widows their own calf and a cow for 18 months, and after the women have raised the calves well, they are entitled to keep the cow. The non-profit offers supplementary livestock training and food making skills so that they can have a source of dairy products and a small livelihood for their family. The non-profit continues its pledge for a healthier rural environment with the establishment of clean drinking water in schools and communities. 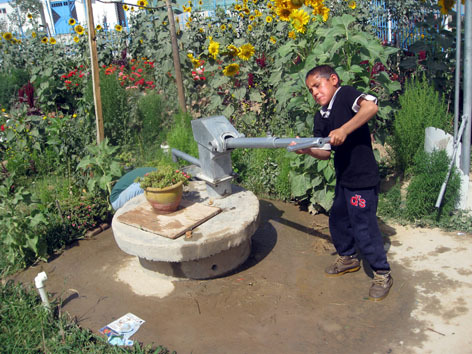 Mahboba’s Promise has since set up many water pumps and wells in Jaghori, Panjshir Valley and Kabul. Widows are also provided with training and materials for rebuilding homes or building new ones. The non-profit is committed to helping these disadvantaged women raise their children in a more safer environment. The organization also hopes to raise future leaders in Afghanistan with a new youth leadership program. Lessons will include Ethics, Philosophy, Politics and Social Studies. Mahboba’s Promise is working on a new plan for a permaculture project with Geoff Lawton and the support of Muslim Aid Australia to start a sustainable living initiative in Kabul. Individuals – The non-profit is looking for sponsors for widows and orphans, donors, volunteers and fundraisers. You can also join the non-profit for a small fee. Organizations – The non-profit is also seeking corporate sponsors, donations of services or goods, OR you can request Mahboba as a speaker.